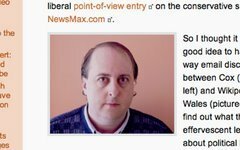 Bob Cox is apparently aware that his radical right-wing rants aren’t going to win him any friends in the more exclusive circles he hopes to move in. What does one do when their personality doesn’t fit with their ambitions? Change the personality, of course. Well, maybe just give the appearance of a change. Your final post at The National Debate is clearly the act of a rat abandoning a sinking ship. It’s a smart move to repackage your particular brand of lunacy into something more palatable to a broader audience. As they say over at the Fox network, I wish you well.